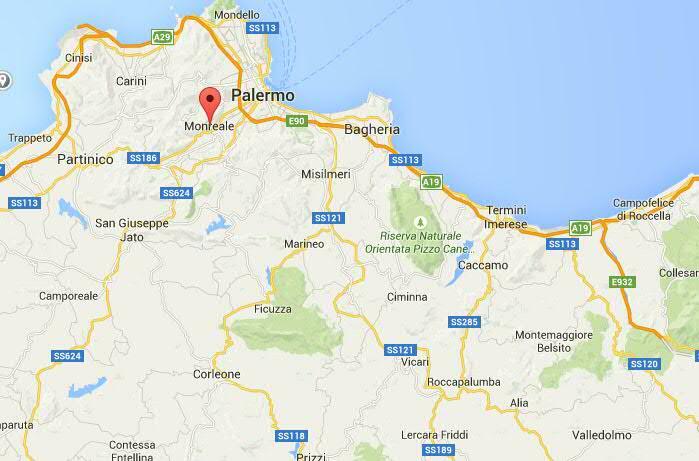 Not far from Palermo, up to the hill behind the town, there is a town that holds a great treasure: Monreale. Upon arriving in Palermo we decided to dedicate the rest of the day visiting Monreale. Apart from the ups and downs to reach Monreale, once we arrived we were lucky to find a parking place. Warning: in Palermo and surroundings is not easy to find a car park; if you decide to rent a car, choose a small and manageable one. The famous Cathedral of Monreale is located in the center of town. It is impressive and definitely you can not miss it. 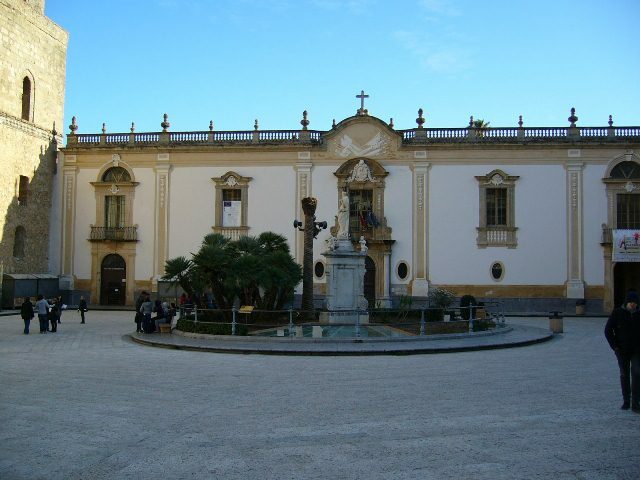 It overlooks two squares: from one you have the entrance of the Cathedral and the other one is where you find the entrance to the Cloister. We recommend visiting the Cloister before anything else, since it has fixed opening hours and to access it you have to pay a ticket [€ 6.00]. It’s well worth a visit for its uniqueness and the quiet that you can feel while walking under the colonnade. 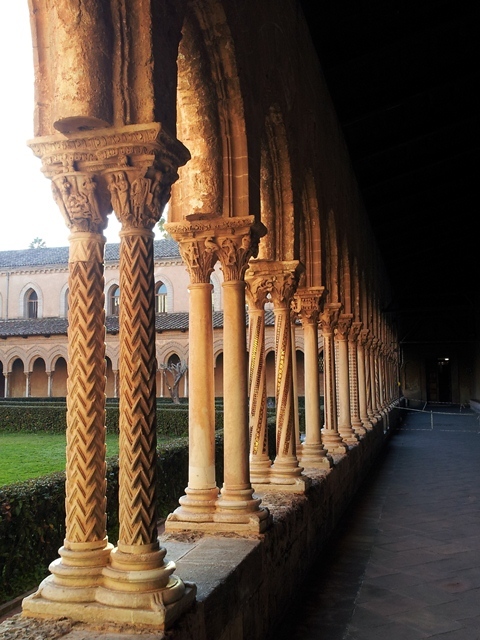 The columns of the cloister are all different; all tops are different and are true masterpieces. The arches that surmount the columns are on Arabic fashion: a clear sign of Arab-Norman architecture. The garden inside the cloister is a bit ‘”mangy”. 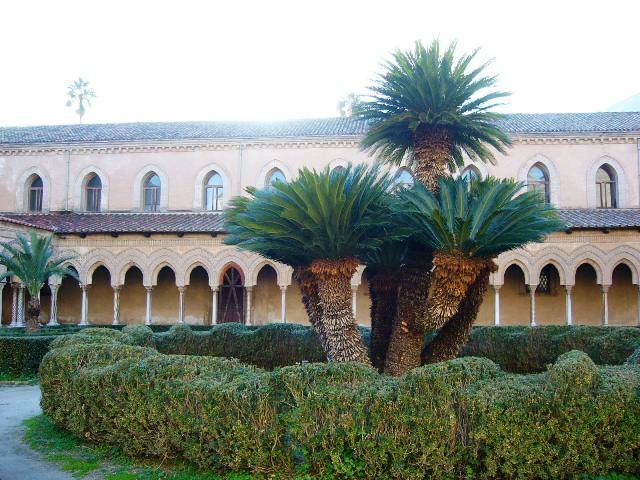 Some trees, deciduous, were reduced to trunk and branches, but in the precise center there is a palm tree which is also a symbol of the cloister: it has multiple trunks and branches; an original palm tree indeed! After walking in the cloister enough time to enjoy the quite and beauty of the columns is time to enter the cathedral. There isn’t a direct passage, but you need to go out on the square Guglielmo II and cross the side door of the church, which is located instead in Piazza Vittorio Emanuele. The main door of the cathedral, which is under the porch of Piazza Guglielmo II has a really impressive bronze panel depicting the Norman symbols [lion and griffin] and was created by Bonanno da Pisa. This big door, however, is open only on special occasions. You have then to enter through the side door and lean out over the central nave; you will immediately be dazzled by the sunlight reflected on the golden mosaics. In this church, in fact, everything you see on the walls and on the floor is made up of mosaics. The huge Christ Pantocrator behind the main altar is impressive in size and precision: it looks like a painting! 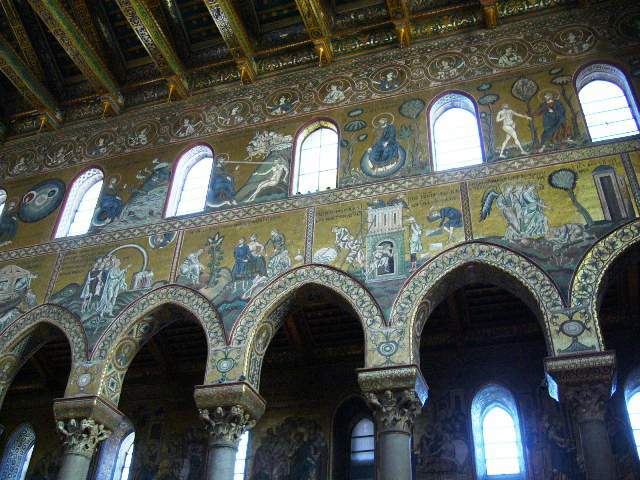 The Cathedral of Monreale is the Christian church with more square meters of mosaics better preserved in the world. About 6,000 square meters of tiles cover the walls and the ceiling, many more than the mosaics of San Marco in Venice, which has about 4000 square meters. We specified “Christian church” because in fact when we saw the mosaics of the transept our thinking immediately goes to Istanbul and Hagia Sophia. 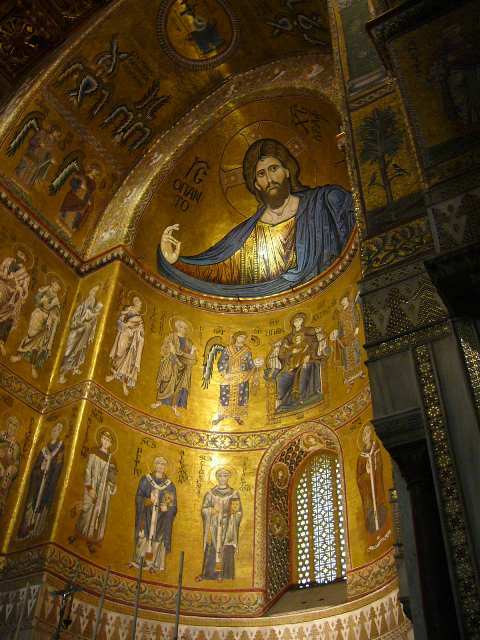 The 10,000 square meters of mosaics of the mosque in Istanbul [no longer Christian church as originally built] are unfortunately in large measure covered by the symbols of the Muslim religion and therefore can no longer compete with what you can see in Monreale. What we liked the most? 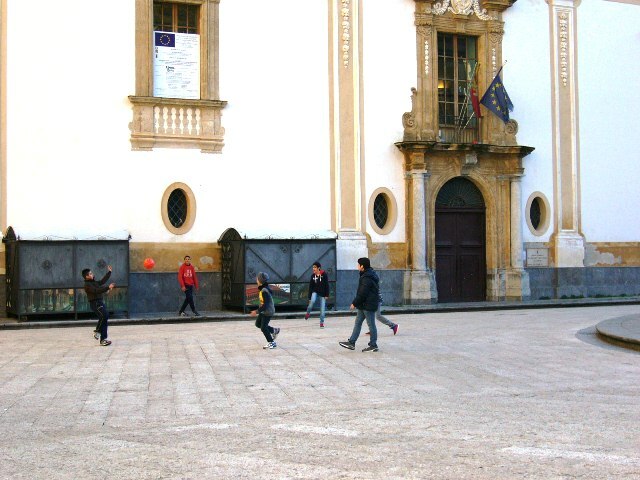 The mosaics are certainly impressive, but the thing that we liked to Monreale found it on the square outside the cathedral: boys playing football, safely without danger and without thoughts. about mmy problem. You are amazing! Thanks!